Federal Government ends need to spray rear bumper of semi-trailer white. 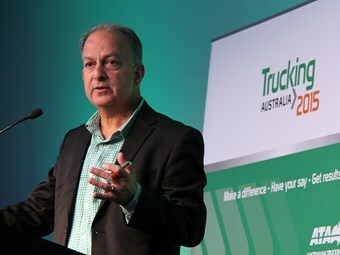 ATA CEO Chris Melham has welcomed the decision to scrap the need for a semi-trailer's rear bumper to be white. Trucking operators will soon no longer need to paint the rear bumper of their semi-trailers white, after the Federal Government announced it was scrapping the requirement. Major projects minister Paul Fletcher says Australian Design Rules (ADRs) will be amended to end the requirement in a move expected to save the trucking industry about $12.4 million over the next 10 years. The white bumper requirement was initially introduced to improve a truck’s visibility, but Australia’s governments agreed it had no impact on vehicle safety. "More than 4,500 semi-trailers are manufactured in Australia every year and they will no longer require the extra step in production to paint the rear bumper a different colour to the main trailer body," Fletcher says. "These changes will be welcomed by industry." Indeed, the Australian Trucking Association (ATA) has applauded the announcement. It originally proposed removing the requirement. "Until now, it has been a legal requirement under the Australian Design Rules for a semi-trailer rear bumper to be painted white," ATA CEO Chris Melham says. "This was intended to improve visibility for other road users, but worked better in theory than in practice; the bumper makes little difference during daylight hours, and the semitrailer’s rear marker plates provide much greater visibility benefits at night time and in low-light situations. "The rule was inconsistent in that it only applied to semi-trailers – other types of heavy vehicle were exempt from the requirement." Melham says the ATA regularly receives reports of operators receiving defect notices due to paint on the rear bumper being scratched or obscured. "This had nothing to do with the vehicle’s safety. You certainly wouldn’t expect to be fined if you scratched the paint on your car," he says. The change will take effect for new trailers once the relevant amendment is registered on the Federal Register of Legislative Instruments. The ATA says the National Heavy Vehicle Regulator, Western Australia and the Northern Territory will then need to consider issuing exemptions to cover semi-trailers already in service. "I applaud the common-sense approach that minister Fletcer has taken to removing this nusiance red tape from the indsutry and trailer manufacturers," Melham says. "Once it flows through to the in-service regulations, it will help trucking operators focus on transporting goods safely, not worrying about the paint on their bumper." Fletcher says removing the white bumper rule is part of the Federal Government’s commitment to align Australia’s standards with international vehicle regulations. He says further reforms will be announced in the coming months. "Harmonisation with international standards provides access to the latest vehicle technology at the lowest possible cost," Fletcher says. "An important part of this is the removal of unique Australian content in the ADRs where it cannot be justified."